I’m taking place in another United Webcomics event! 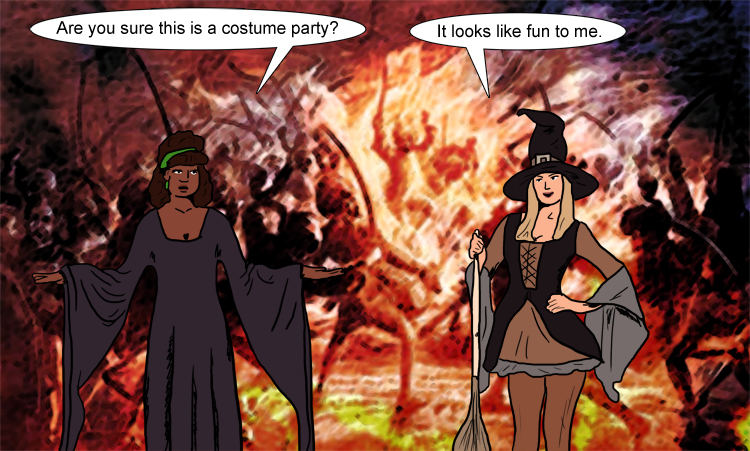 This one involves celebrating a European witch holiday, and drawing each others characters! I got a comic called In the Hail of Brambles by Niaouro Psaka. It’s a render comic, so trying to draw those characters was a challenge. Hopefully they like what I did with it. You can find a list of all the other comics who participated at the United Webcomics site. What is this witch holiday all about? Here’s what I found out about it. Walpurgis Night (Walpurgisnacht), the night before May Day, is similar to Halloween in that it has to do with supernatural spirits. And like Halloween, Walpurgisnacht is of pagan origin. The bonfires seen in today’s celebration reflect those pagan origins and the human desire to drive away the winter cold and welcome spring. Celebrated mainly in Sweden, Finnland, Estonia, Latvia, and Germany, Walpurgisnacht gets its name from Saint Walburga (or Walpurga), a woman born in what is now England in 710. Die heilige Walpurga traveled to Germany and became a nun at the convent of Heidenheim in Württemberg. Following her death in 778 (or 779), she was made a saint, with May 1 as her saint day. In its Christian version, the former pagan festival in May became Walpurgis, a time to drive out evil spirits—usually with loud noises. In Bavaria Walpurgisnacht is known as Freinacht and resembles Halloween, complete with youthful pranks.